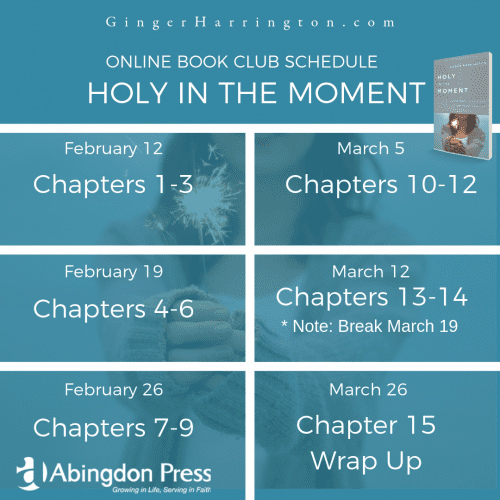 Home Enjoy Life Holy in the Moment Book Club–Let’s Get Started! 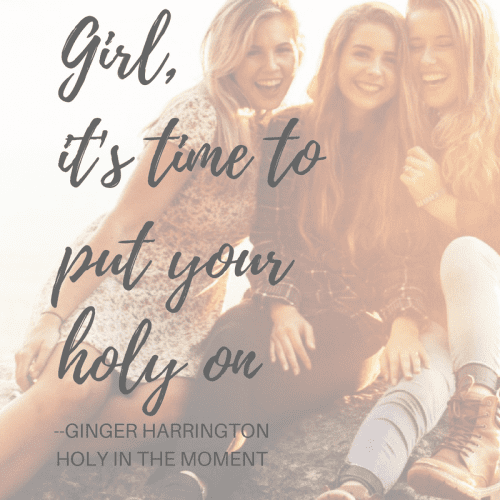 Holy in the Moment Book Club–Let’s Get Started! Hello Friends, we’re getting started with a six-week series as we dig into Holy in the Moment: Simple Ways to Love God and Enjoy Your Life! I’m so excited to join together to deepen our reading of the book. If you need a copy of the book, you can purchase here. Thanks so much for sticking with me through the series. When I can I’ll add a little something else on the blog for those who aren’t doing the book club. Participate in a variety of ways. LEVEL ONE: Each week I’ll post discussion questions and a few tidbits to think about. You can participate on a variety of levels. You can simply read along here on the blog where I’ll post a selection of questions to consider. You can participate by commenting here on the website as you want to join the conversation. LEVEL TWO: Sign up for my newsletter to receive printable goodies as well as downloadable complete guide for each week. Use the guide to reflect or journal on chapter content as you process the material in the book. LEVEL THREE: For the most personal interaction, request to join the Holy in the Moment Community, a private Facebook group where I’ll be posting a discussion thread each Tuesday morning. Engage with other readers and make new friends as you respond to a variety of thought-provoking questions. Join me for weekly FB Live Broadcast on Tuesday nights at 8 pm EST! However you choose to participate, please honor and respect others in your responses. Unkind, judgmental, or nasty comments will not be allowed. Sound good? Let’s build relationships and encourage one another! Here are a few questions from chapters 1-3. If you want the complete discussion guide, sign up here. What thoughts come to mind when you think about the word “holiness”? Do you struggle to think of yourself as holy? Why or why not? How has fear or anxiety impacted your faith? How can remembering that believing God is a decision, rather than an emotion, help you stand firm in faith? How can understanding not every moment is good but God is good in every moment change how you navigate a challenge you currently face? How does His goodness provide a stable foundation when your circumstances are unstable? How does the truth that holiness is a gift from God rather than a code of conduct to keep or a standard to achieve change the way you view holiness? How does it relieve the pressure you put on yourself to please God by your good behavior? Where are you discovering the holy in your everyday moments? How can turning from self-reliance to relying on Christ change the moment? How can discovering the truth that God loves you simply because you are His child free you from the pressure of performance and achievement? Consider the story of the woman who washed Jesus’ feet with her tears in Luke 5: 36-39. What is God teaching you through this woman’s experience? What are you learning about loving God when you feel hopeless or unlovable? What changes when you remember that sin does not disqualify you from God’s love? May the Lord bless your book club, Ginger. I just loved this book, was just telling Jose it was one of the best books I read last year. May many women be encouraged. Thank you, Betsy! Your words are an encouragement to me! I’m praising God for what He is doing through the hearts of readers! I’m excited about your book launching this week! More of God is excellent!